Bigasoft iTunes Video Converter can convert various videos/audios like AVI, WMV, MKV, FLV, MP4, WMA and more to iTunes Video MP4 and music MP3 for easily import movies/music to iTunes for enjoy. Adding any video to iTunes is never so fast and easy. Bigasoft iTunes Video Converter is professional all-in-one converter for iTunes! Benefiting from the most advanced conversion and efficient performance technology, Bigasoft iTunes Video Converter can convert various videos to iTunes video MP4, MOV, M4V and iTunes music MP3, AAC, AIFF, M4A with fast speed and high graphic and sound quality. Adding any movie files to iTunes is never so fast and easy! Key features: 1. iTunes Movie Converter The iTunes Converter converts various video to iTunes video MP4, MOV and M4V from various videos including AVI, Xvid, DivX, H.264, MP4, 3GP, MKV, WMV, RM, FLV, MOV, WebM, F4V, Bik, 720p, 1080p, 1080i HD, AVCHD videos. 2. iTunes Music Converter The program also works as easy-to-use iTunes Music Converter. It can convert various audio to iTunes music MP3, M4A, AAC and AIFF and extract audio from a variety of videos such as YouTube videos, music video, AVI, MP4, MOV and more. 3. Preset ready quality video for all types of iPod, iPad, iPhone, and Apple TV 4. Designed with a smart video editor. You can easily cut, trim, crop, merge, split videos, add water mark, subtitles and so on to meet all your different needs. 5. 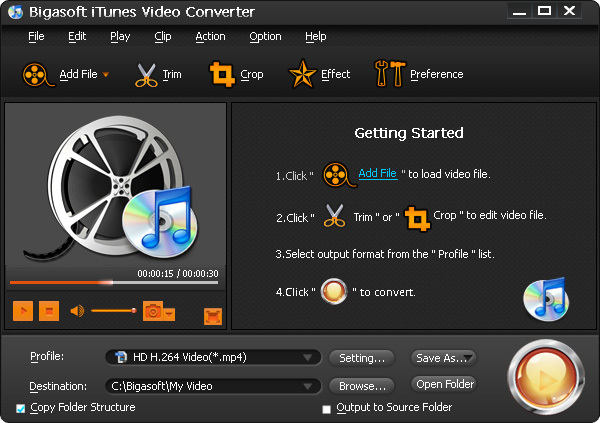 Batch conversion and folder conversion The iTunes Converter supports batch converting multiple video files. It even supports adding folder to the program and process conversion of all the videos in the folder. 6. Easy to use By super easy and intuitive user interface, only 3 steps, and you can easily enjoy favorite movies wherever you are. 7. Super conversion powered with NVIDIAÂ® CUDA computing technology, multi-tasking and multithreading 8. Support Multi-language including English, German, French, Spanish, Japanese, Arabic, Italian and Chinese. 9. Supports all Windows including Windows 8, Windows 7, Windows XP, Windows Vista, and Windows 2000. Best Free DVD to iPhone is a totally free DVD converter which is designed to convert DVD to iPhone MP4, iPod MP4, and Apple TV MP4 video file for playing DVD on iPhone, iPod, and TV set via Apple TV. Best Free ISO Burner is a freeware that will allow you to burn ISO images to a CD/DVD. It can directly burn your ISO and CD/DVD image file to CD-R,CD-RW, DVD-R,DVD-RW,DVD+R and DVD+RW. Best Free DVD Creator is a conversion utility with burn support to create DVD movies from video files. Any existing popular file formats can be converted to DVD and played on any DVD player. Aiseesoft HD Video Converter ist die beste HD Converter Software, die HD Video sowie andere allgemeine Videodateien in allen populÃƒÂ¤ren Video- und Audioformate mit 6X schnellerer Umwandlungsgeschwindigkeit konvertieren kann. Best Free YouTube to iPhone is a tool that lets you convert YouTube videos for use on your iPhone. All you have to do is paste in the URL and within minutes your selection will be available as an MP4, ready to transfer. Best Free CD Ripper is a convenient tool to extract music tracks from audio CD, and save them to WAV or MP3 files.You can use it to convert your favorite CD to MP3 files, and play them on portable MP3 player. iDVDrip DVD to Google Phone Converter is the best and the closest companion for Google Phone users. It can easily rip and convert DVD to Gphone/G1 video formats MP4, WMV, H.263 3GP, H.264/MPEG-4 AVC and MP3, AAC, AMR, M4A, WAV, WMA audio format. Best Free ISO Creator can easily create ISO image file from any files and folders. It is an ideal tool to create ISO file. Aiseesoft Video Converter fÃƒÂ¼r Mac ist eine der besten Umwandlungssoftware fÃƒÂ¼r Mac-Benutzer, die nahezu alle Video in MOV/AVI/MP4/FLV/MKV/3GP/VOB usw. auf Mac schnell umwandeln kann. Xilisoft Blu-ray Ripper for Mac is designed to rip Blu-ray discs/ M2TS videos and convert to the most popular videos like AVI, MPEG, WMV, DivX, MP4 formats and even High Definition videos in format of H.264/MPEG-4 AVC, Apple TV h.264 720P and etc. This site does not contain serial number, crack, keygen Bigasoft iTunes Video Converter serial number : serial number is the simplest type of crack. A serial number(cdkey,product key,etc) is register the program as you may already know. a crack or keygen may contain harmful software. If you cannot find the exact version you want, just give it a try. for more information read .nfo/.txt/.diz file include in zipped file.